We are always interested in recruiting enthusiastic scientists and welcome new ideas and techniques. Please contact Sean to enquire about Honours, Masters, PhD or Postdoctoral positions in the lab. Below is a list of ongoing projects. Dscam2 produces two protein isoforms (A and B) that differ at a single immunoglobulin domain. Isoform expression is highly regulated with most cells expressing either A or B, but not both. This is unusual as most alternatively spliced genes studied to date express different ratios of isoforms rather than one isoform exclusively. We have recently identified Muscleblind (Mbl), a conserved splicing factor, as a regulator of cell-specific Dscam2 isoform expression (Li and Millard 2019). Mbl promotes expression of isoform B while inhibiting the expression of isoform A. Future studies will interrogate the mechanisms through which Mbl regulates Dscam2 cell-specific isoform expression. 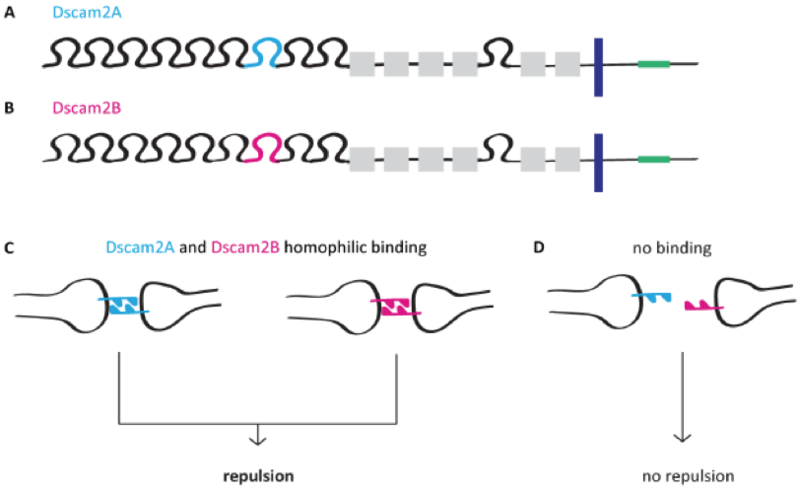 Isoform-specific homophilic binding of Dscam2. (A) Isoform Dscam2A contains one variable immunoglobulin domain (blue), nine invariable immunoglobulin domains (black), six fibronection domains (grey) and a transmembrane domain (dark blue). (B) Dscam2B differs with Dscam2A at a single variable immunoglobulin domain. (C) Homophilic binding of Dscam2 is isoform-specific and can lead to repulsion. 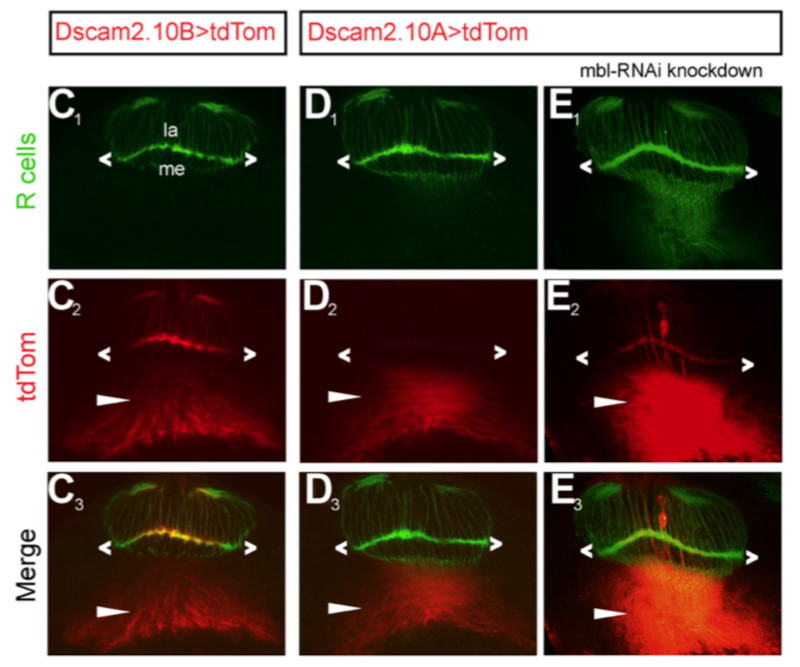 Isoform-specific expression of Dscam2 in lamina neurons. Isoform A is expressed in L2, L3 and L5 neurons (left) and isoform B is expressed in L1 and L4 neurons (right). This is a composite image from two different isoform reporter lines where random subpopulations of lamina neurons were labelled using the Flpout technique . Photoreceptors (red). Mbl represses Dscam2 isoform A. (C1-C3) Isoform B is expressed in photoreceptors (R cells). A marker specific to R cells is shown in green and isoform B reporter expression (tdTom) is in red. Isoform B is expressed in both R cells (carrots) and in deeper regions of the optic lob (arrowhead). (D1-D3) Isoform A is not expressed in R cells (carrots), but is expressed in deeper regions of the optic lobe (arrowhead). (E1-E3) When mbl is knocked down in photoreceptors, isoform A turns on in these cells (carrots). From Li and Millard (2019) Sci Adv. We demonstrated in 2014 that regulated alternative splicing of Dscam2 is required for attaining the proper morphology of neurons and we have expanded these studies to synapses. Photoreceptor synapses contain multiple postsynaptic elements that express different isoforms of Dscam2. We generated knock-in animals that only express a single isoform from the endogenous Dscam2 locus and have been analysing them for synaptic defects. When these postsynaptic cells express the same Dscam2 isoform, fewer synapses and morphological defects in dendrites are observed (Kerwin et al. 2018). We interpret this as evidence for inappropriate repulsion between the postsynaptic cells when they express the same Dscam2 isoform. (A) The variable region of the endogenous Dscam2 locus has been removed via recombination mediated cassette exchange. A cDNA containing exon 9 and each of the alternative exon 10s was exchanged for the variable region to create single isoform lines that express one isoform of Dscam2 from all Dscam2 positive cells. Decreased synapse number in Dscam2 single isoform lines. (A) A schematic of a photoreceptor synapse indicating the pre and post-synaptic markers used in this study. L1 and L2 normally express different isoforms of Dscam2. (B) Confocal images of Brp (presynaptic) puncta in WT (B) and single isoform lines (C, D). (E) Quantification. Dscam2 produces two alternative isoforms that mediate isoform-specific homophilic binding and are expressed in different subsets of cells. Thus, the two Dscam2 isoforms could function as distinct homophilic recognition molecules in different neurons or alternatively, each isoform could have unique functional properties. To address this, we are investigating how Dscam2 and regulated isoform expression affects synaptic physiology at the larval neuromuscular junction (NMJ). We hypothesize that Dscam2 has synaptic functions that may be independent of homophilic binding. Dscam2 isoform B, but not isoform A is expressed in motor neurons. Shown are larval brain/ventral nerve cord preparations from isoform reporter lines. Motor neurons that extend from the nerve cord to the muscles express isoform B. 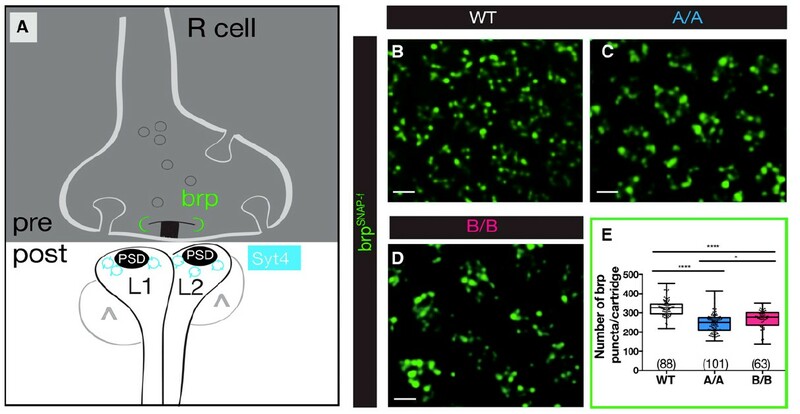 We have found that in the learning and memory centre of the Drosophila brain, the mushroom body, Dscam2 protein gets trafficked to the dendritic compartment. We are investigating whether this is due to protein or mRNA localisation and the role that Dscam2 plays in the formation of mushroom body synapses. We hypothesise that Dscam2 plays a role in the formation of mushroom body claws, the postsynaptic structures that receive input from the antennal lobe. 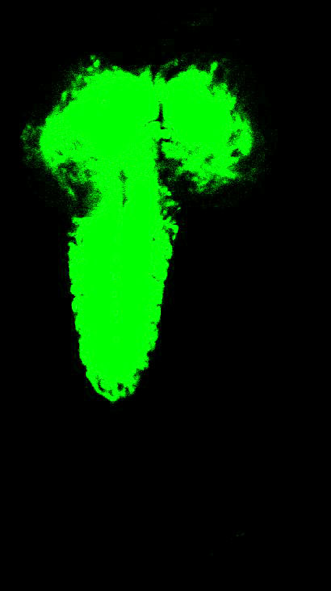 Mushroom body axons (green) in the central brain of the fly. Magenta staining is a presynaptic marker. Dscam2 has different functions in different neurons, but the molecular pathways that lead to these different outputs have not been identified. We are currently trying to identify proteins that interact with Dscam2 to better understand its functional diversity. One approach is to tag the endogenous Dscam2 gene with GFP, use this tag to pull it down from fly brain lysates and then identify associated proteins using mass spectrometry. Dscam2::GFP is functional in the fly visual system (A) Schematic of an endogenous GFP-tagged Dscam2 that we generated using CRISPR. 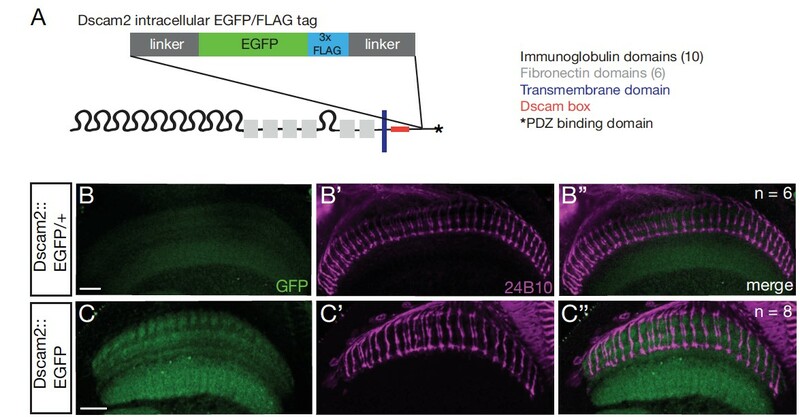 (B-C) Animals heterozygous (B) and homozygous (C) for Dscam2::GFP have normal photoreceptor projections, in contrast to Dscam2 mutant animals which have highly disorganised photoreceptors. Dscam2::GFP (green), photoreceptors (24B10 antibody, magenta). We are collaborating with Naomi Wray’s lab (IMB/QBI) to investigate genes associated with sporadic Amyotrophic Lateral Sclerosis (ALS, also called motor neuron disease) through GWAS studies in the Wray lab. 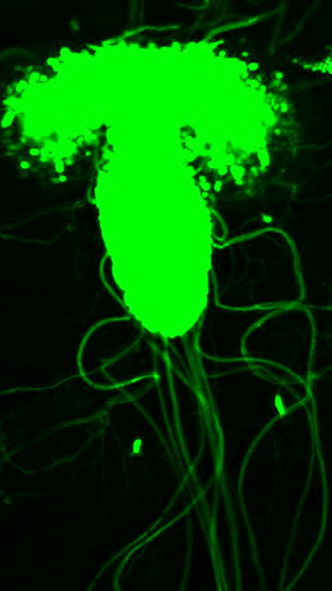 We are generating mutations in fly homologues of these genes using CRISPR and then analysing the morphology, synaptic composition and neurophysiology of the larval neuromuscular junction (NMJ). The goal is to not only validate the GWAS associations, but also to understand how these proteins function at the NMJ. Mutations in the fly homologue of the sALS candidate gene, GGNBP2, lead to smaller motor neuron terminals and fewer synapses. (A) Schematic of the CRISPR strategy used to delete the fly Ggnbp2 gene. (B-B’) WT larval motor neurons labelled with a membrane marker (magenta) and antibodies against the presynaptic marker, brp (cyan). 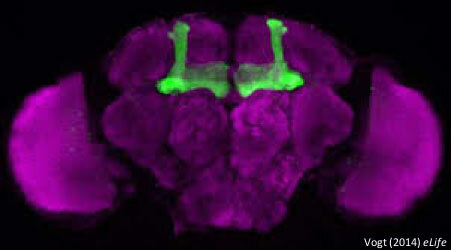 (C-C’) Ggnbp2 mutant larval motor neurons labelled as in B. 1. Mapping binding sites for the factor that regulates Dscam2 alternative splicing using CRISPR-Cas9 in Drosophila. 2. 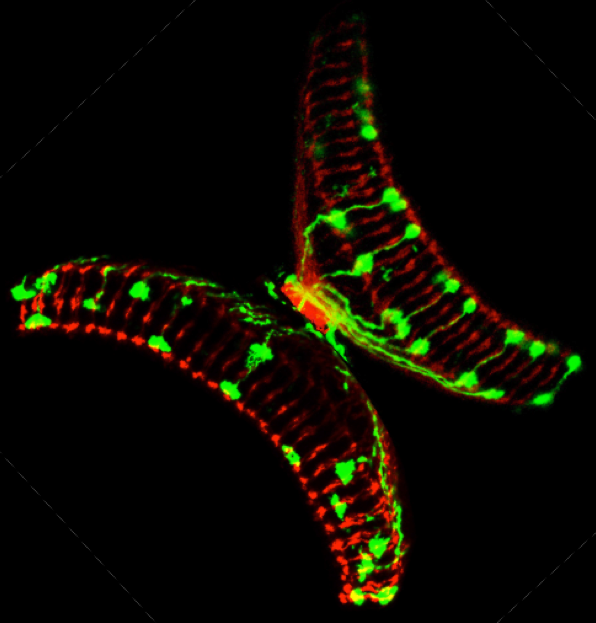 Validating sporadic Motor Neuron Disease candidate genes in the fruit fly. 3. Investigating whether the splicing factor, Rbfox1, represses Dscam2.10B isoform expression. 4. Investigating whether Dscam2 and Presenilin function in the same signaling pathway in motor neurons. 5. Assessing whether different cytoplasmic isoforms of Dscam2 confer dendritic localization.